Come and join us for another class in Cathy’s home studio. 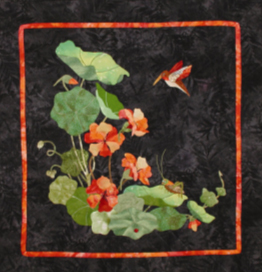 The class project “Nasturtiums” will give you hands on experience while learning how to Appliqué the Easy Way. Fabric kits are available for $50.00 which includes pattern, fabric for quilt top, and embellishments. If you are using your own fabric, a supply list will be sent to you upon confirmation of your registration. *I will have supplies to share and to purchase. You can register by phone at: 714-530-2577, or by mail at the address above. Sorry, I am unable to take reservations online. A deposit of $25.00 will hold your place. Checks, Master Card, or Visa will be accepted. Deposits need to be made by July 3rd so that lunch arrangements can be made. Space is limited, so please reserve soon! If you would like to stay over, a list of local quilt shops including M&L will be provided for your enjoyment.